SAD lamps can be a great tool for many people that struggle with Seasonal Affective Disorder and other related conditions. Winter brings short days and darker mornings. This seasonal shift can have a significant impact on the energy levels and mood of many people. What some call the “winter blues” is actually far more severe for a lot of people as they suffer with sleep disorders, fatigue and depression. 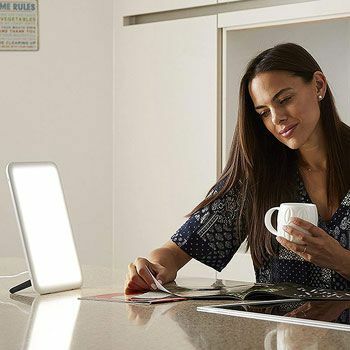 SAD light therapy devices can help by simulating sunlight and brightening a morning. What should consumers look for when buying a top rated SAD lamp for their condition? The first thing to consider with any of these lamps is the light source. Some lamps will use bulbs, while others work via LEDs. Check to see what tone and wavelength the light is on. Blue lights can be a problem for some SAD sufferers as they are known to induce headaches. Cool white lights are much more preferable. Then check the optimal lux of the light. Ideally, the lamp should produce 10,000 lux at a convenient distance for a good session. Also, check the specification for diffusers and intensity settings. Then there is the design of the lamp and its size. As you will see from the models below, these lamps come in different shapes and sizes. Some are sturdy lamps that sit on the desk and have a wide field of light. Others are thinner, portable models that resemble tablets. Other brands like to create floor lamps with an adjustable neck. Check the dimension to make sure it is a good fit. Also look at the specification for any mention of a kick stand, charging cable or other extras. The first of the Lumie SAD light products in this guide has a large light field that comes from three large full spectrum bulbs. This should provide a cool, high-quality light source that is pleasant and consistent. It produces that optimal 10,000 lux at a distance of 35cm, which means that it is a great choice as a desk lamp. 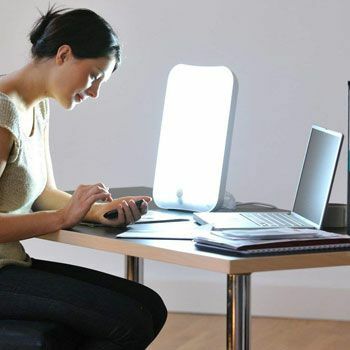 This light is designed for use during 30 minute sessions and has great potential for sleep and mood issues. The design of the Lumie Brazil SAD light box is also appealing because of the dimensions. The face of the light is quite wide, but it tapers into quite a thin, attractive shape. It is pretty sturdy when out on the desk, but doesn’t take up too much space. The minimal controls are also a benefit to users because it is so easy to set up a session at any time. 2. Philips HF3420/03 Blue Energy SAD Light. It is important to look at the wide variety of light sources and designs that are available in SAD lamps. That is why we have added a blue light energy device like this. There are mixed reviews about these blue lights. Some people with light sensitivity and other conditions can’t handle this wavelength very well. But, there are also that will find that this form of daylight simulation is helpful for SAD. This device uses UV free light in 20-30 minute sessions to improve energy levels. 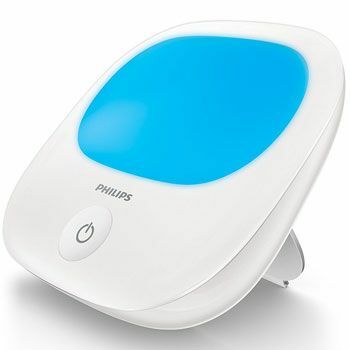 The Philips Intense Blue Energy SAD Light HF3420/03 itself is pretty basic and compact. 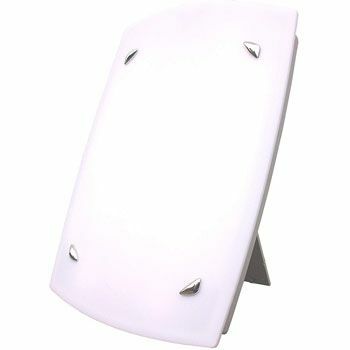 It is sold as an “on-the-go” product, with this small shape and stand at the back. There are three different intensity settings to choose between, but only one button. This user-friendly approach lets buyers cycle between the options and keeps things nice and simple. 3. Redstone SAD Light Box. This Redstone SAD device is another example of a top rated SAD lamp that makes good use of its bulb. There there are 2 36w lights that can offer 10,000 lux at the right distance. The tubes are also energy saving, which should give them a little more longevity. The size of this SAD light should be just right for many people looking for a desk lamp. The dimensions of the face are large enough to help with the projection of the light. It is 48cm tall and 30 cm wide. This means that it shouldn’t stand out too much on a desk in an office setting. There are two additional benefits with the hardware here too. The first is the use of a reflective cover, which helps to soften the light from those tubes. The other is the folding tripod stand. This stand adds to the portability of the device. 4. Beurer TL40 Daylight Lamp. The quality of the light source really is important for anyone looking to use these SAD lamps every day. Certification of a medical grade system is a great starting point. But, it also helps to look for some smaller details. For example, this mode promises to be flicker free, as well as UV-free. This consistent quality comes in part from the use of LED tech over bulbs. These LEDs provide 10,000 lux for some great morning sessions. Buyers will also appreciate the compact shape and curves of this Beurer TL40 SAD Light. Some models aren’t the prettiest to look at and immediately look like medical devices. This one is different and could pass as a more stylish option. The 24 by 16 face isn’t as broad as other models, but fits nicely on cluttered desks. There is also the benefit of one button operation for ease of use. 5. Lumie Arabica SAD Lamp. 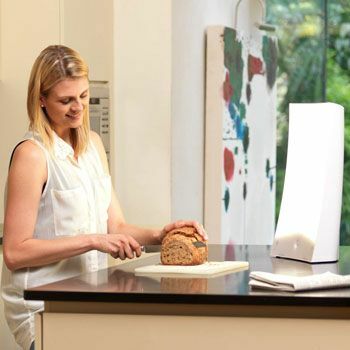 First of all, it helps to ignore some of the sales photos of this Lumie Arabica SAD light. Some images have had the colour altered to enhance the blue tones. This gives the wrong impression about the wavelength of the light source. This lamp actually uses a cool white light that is pleasant for many users. The description talks about 30-60 minute sessions at 50cm, but this only offers a 4,000 lux. It is possible to have shorter sessions at 25cm, which equates to that optimal 10,000 lux. Like many of these SAD lamps, this is a portable model that works well as a desktop model. There is a large face on this tall product and the light stretches right across the front for an optimal experience. Again, there are simple controls for ease of use. It may look a little unstable, as it uses a small base rather than a kick stand. But it is said to be pretty sturdy. This next product in these top rated SAD lamps guide may seem a little out of place at first. However, we want to show you that there are other ways to enjoy the projection of light for an effective light therapy session. These glasses are sold as The world’s best light therapy glasses, although there are mixed opinions on their effect. This option uses green light as a safe choice within the wearable device. There are two intensities of 300 or 500 lux, which should be equivalent to 10,000 lux at that distance. 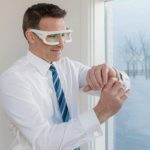 The idea here is that this wearable ReTimer SAD Light Therapy Glasses are as portable as they come. Users can walk around the house as they make breakfast or get ready for work and still get their daily treatment. The worth of this option depends on how leisurely you want your morning to be and how comfortable the glasses are. This SAD lamp from Beurer is another that makes good use of LED tech instead of bulbs. This means that there is a more even light source with that soft white light. There is also the promise of no flickers that may irritate users with specific medical conditions. The even light is also bright enough to deliver a strong light source for an effective therapy session. There are aspects to the design of this Beurer TL90 that make it look a lot like some of the other top devices in this guide. The light stretches across the face of this wide product and the “medium-large” size is great for desktop applications. The main difference here is that this one is on a tilting stand. The benefit of this is that users can create the optimal angle for the light for the best results. This is great if there are multiple members of the household using this device at different periods in the day. The next option is another one that goes in a different direction. There are many people that like the thinner devices because they are more portable. It is easy to pack them up in a bag and take them to the office or on holiday. 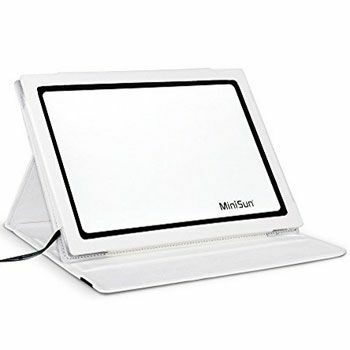 Tablet-shaped devices like this ultra slim MiniSun SAD light model are a great way to increase portability. This option has a large “screen” that measures 16 by 22 cm and uses bright, reliable LEDs. The added bonus with this option is the use of the folding case. The case has a suede effect lining to protect the light, but also the same folds and supports as you would expect to find in a more traditional tablet case. This means that the case turns into a stand for that perfect angle and increased ease of use. Also included is a 2.5 metre cable, which is longer than those of some other devices. Next, we have a model from Duronic. The specification for the Duronic SADV1 light and the therapeutic elements are very similar to that of the other desktop SAD lights here. There is an optimal lux of 10,000 with a cool white light source from two reliable bulbs. It is also medically certified as a SAD device and has a large face at 48 by 34cm. The differences here come down to some of the details in the design. The first is the inclusion of a wall mounting option. Most of these lamps only have the folding stand for use on the desk. This one gives users greater choice. Then there is the fact that the power switch is hidden from view at the top of the product. Finally, there is a choice of either white or grey for the casing. These little details may not seem important, but they do show a level of care. The final model in this guide to the best SAD lamps on the market right now is another one from Lumie. This highlights both the popularity and consistency of this brand. The Lumie Vitamin L Slim Lightbox has a decent sized face at 20 x 28 cm with plenty of effective LEDs. 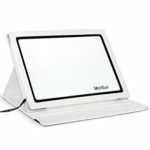 It provides a 10,000 lux at 20cm, which is ideal for a 30 minute session of light therapy. There is also the added bonus of the rippled diffuser that softens the light further. The interesting thing about this option is that it blends a couple of different styles together. The slim build is similar to that of the tablet devices, which makes it easy to carry around between different locations. The 830g weight also helps here. Yet, there is also a stand at the back that allows buyers to use it in either portrait or landscape mode on the desk. This is an unusual addition because most of these lights are tall and portrait mode. 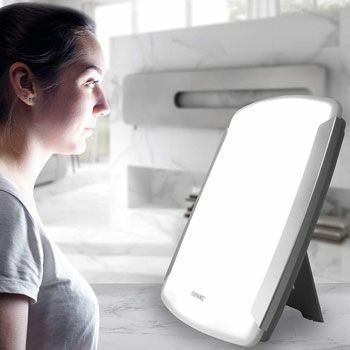 Choosing the best SAD light therapy lamp for your needs. The products above showcase the wide range of styles and options available. Some will offer a greater therapy session than others. Some will be far easier to use. Each SAD user has their own considerations and needs. This is why it helps to read user feedback as well as the specification when choosing a product. It is important not to get too hung up on the features and look of these devices. The important thing is that these lamps offer the therapeutic session that you need. It is no good having a large desk lamp if it doesn’t fit on your desk. These devices are also no good if you can’t sit close enough for a full session. There is a chance that whichever model you choose, it may not end up being a good fit. There are mixed reviews on so many of these products because results are down to personal conditions and preferences. Take your time to compare these top rated SAD lamps, try a few out and see if you can find a helpful aid for your condition this winter.